Forward Luke James is looking to put 'frustrating' spells at Peterborough and Bradford behind him following his return to Hartlepool United. 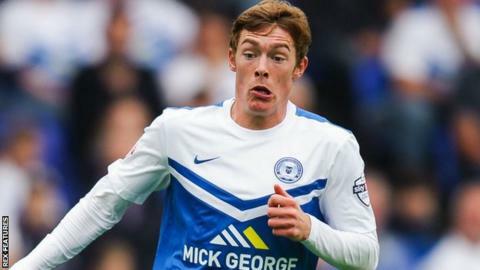 The 21-year-old striker joined Peterborough in September 2014 but scored just two goals in 34 matches and was sent on loan to Bradford. Boss Ronnie Moore brought him back for a second spell on deadline day. "It's been frustrating - I haven't scored the goals I would have liked to," James told BBC Tees. "You just have to put that behind you and that's what I'll be looking to do." James is set to feature at Notts County on Saturday and said: "Even if I only get five minutes I'll be looking to get on the pitch and score." Having netted 22 goals in 99 previous appearances for Hartlepool, the club are hoping he can boost their chances of survival in League Two. They are currently 22nd, only four points clear of the relegation places. "Everyone knows what I think of the club. It's a club I hold great memories of and hopefully that will continue," he said. "I came here on trial for six weeks when I was 12 and I was here until I was 19, so obviously I owe them a massive deal. "I know everything in and out really, so hopefully that should help me settle down a bit quicker." Hartlepool have claimed only four points from their last eight League outings and scored the fewest goals in the division this season, but James remains confident of their chances. "What I've seen from training so far I think it should be alright," he added. "They're a great set of lads willing to work hard for each other and that's all you need really. "It doesn't matter whether you're bottom of the league, top of the league or middle of the table - wherever you are you've just got to take it game by game."